We sourced this chart from our friends at the Montgomery Fund - it is self explanatory in our view. We are recommending caution with investments that are leveraged to the housing market in Australia which would appear at extreme levels. > A housing recovery has been a necessary aspect of rebalancing the economy through the mining bust. 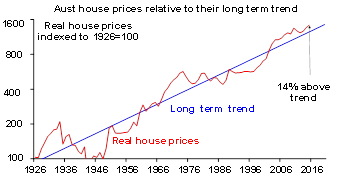 > While Australian property prices are overvalued, this should not be a constraint on the RBA. Expect another rate cut in May with the possibility of more to follow. >The medium term return outlook for residential property is likely to be constrained. Economic upswings in Australia rarely start without a housing upswing. Lower interest rates drive housing demand resulting in higher house prices which boosts consumer spending via wealth effects and drives home building. 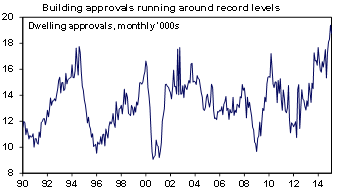 The latter is happening with approvals to build new homes at record levels. While it's generally agreed Australian property prices are high, the reasons for it are subject to much debate with many looking for scapegoats in the form of negative gearing and buying by foreigners and SMSF funds. However, these don't really stack up: negative gearing has been around for a long time and while foreign and SMSF buying has played a role it looks to be small and foreign buying is concentrated in certain areas. The shift to low interest rates since the early 1990s has clearly played a role. Consistent with this, the rise in price levels from below to above trend has gone hand in hand with increased household debt. The trouble is that other countries have lower levels of interest rates and most have lower household debt to income ratios and house price to income ratios. A more fundamental factor is constrained supply. Vacancy rates remain low and there has been a cumulative supply shortfall since 2001 of more than 200,000 dwellings. The main reason behind the slow supply response appears to be tough land use regulations in Australia compared to other countries. High house prices compared to rents and incomes combined with relatively high household debt to income ratios suggest Australia is vulnerable on this front should something threaten the ability of households to service their mortgages. While this vulnerability has been around since the house price boom that ran into 2003 – with numerous failed predictions of property crashes! – the RBA is right to be concerned not to further inflate the property market. 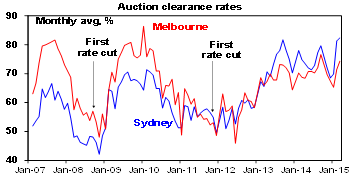 The renewed strength in auction clearance rates this year to record levels in Sydney is a concern. However, there are some offsetting factors. First, home price gains are now narrowly focussed on Sydney. 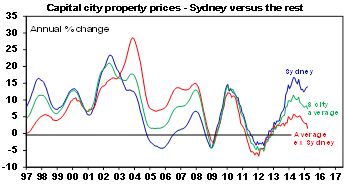 According to CoreLogic RP Data Sydney home prices rose 13.9% over the year to March. But growth across the other capital cities ranged from 5.6% in Melbourne to -0.8% in Darwin with an average of just 1.5%. So, the rest of the Australia is hardly strong. 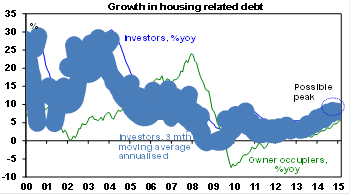 Second, growth in housing debt is running well below the pace seen last decade, and there are some signs of a loss of momentum in the last few months.Investor debt is up 10.1% year on year but reached around 30% through 2003 and in the last few months has slowed to an annualised pace of 9.3%. Finally, the RBA and APRA have pushed down the macro prudential path to contain risks around housing.Tougher APRA expectations of banks were announced in December with the threat of sanctions if these expectations are not met. So while the RBA is right to be mindful of the impact of low interest rates on the property market, the concentration of the property market strength in just Sydney, the signs of a possible topping in investor property loan growth and the heightened role of APRA indicates that the property market should not be a constraint on further RBA interest rate cuts. As the RBA has pointed out in the past it needs to set interest rates for the "average" of the economy. And the "average"still points to the need for lower interest rates as the slump in mining investment intensifies, non-mining investment remains weak, iron ore prices are down another 23% since the February RBA cut, the outlook remains for sub trend growth and ongoing spare capacity in the economy and inflation remains benign. This points to the need for further rate cuts to provide a direct boost to spending and an indirect boost via the inducement to a lower Australian dollar. Expect the cash rate to fall to 2% in May with a strong possibility rates will fall below that later this year. 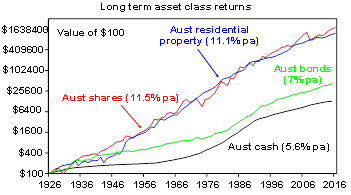 Over the very long term residential property adjusted for costs has provided a similar return for investors as Australian shares. Since the 1920s housing has returned 11.1% pa compared to 11.5% pa from shares. See the next chart. They also offer complimentary characteristics: shares are highly liquid and easy to diversify but more volatile whereas property is illiquid but less volatile. And share and property returns tend to have low correlations with each other so including both offers diversification benefits. As a result there is a case for investors to have both in their portfolios over the long term. In the short term, low interest rates point to further gains in home prices. However, this is likely to be constrained by the economic environment and the impact of tougher prudential scrutiny of bank lending by APRA. Over the next 12 months home price gains are likely to average around 5%, maybe a bit stronger in Sydney and Melbourne (key beneficiaries of the post mining boom rebalancing) but staying negative in Perth and Darwin (as the mining bust continues). The residential property outlook for the next 5-10 years though is messy. Housing is expensive on all metrics and offers very low rental yields compared to all other assets except bank deposits and Government bonds. 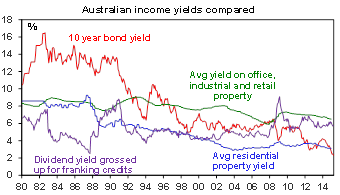 The gross rental yield on housing is around 2.9% (after costs this is around 1%), compared to yields of 6% on commercial property and 5.7% for Australian shares (with franking credits). See the next chart. This means that the income flow an investment in housing generates is very low compared to shares and commercial property so a housing investor is more dependent on capital growth to generate a decent return. So for an investor, these other assets continue to represent better value. We recently spoke to Roger Montgomergy (Sky Business News/Montgomery Fund) about whether he believes Australia is in a Property Bubble. Here is the interview. Australia has a property bubble. Mark Draper: Here with the Roger Montgomery from Montgomery funds. Thanks for joining us Roger. Roger Montgomery: It’s a pleasure mate. Mark Draper: Now when taxi drivers start talking to me in Sydney about the property market, it makes me very nervous. Are we about to see a property crash or what do you think it’s at? Mark Draper: Is that across Australia or New South Wales? Roger Montgomery: They were very high, 18% and so understandably people have taken on more debt but if interest rates go up, the income that you are earning doesn’t rise to pay the higher interest rate, so that’s the problem when you’ve got so much of people’s disposable income paying off a mortgage, so I’ll give you an example. 25 year loan, 80% LVR, at current interest rates, that first year when you are paying off that mortgage, that is taking up using a median house and a median income, about 75% to 80% of disposable income is going to service that mortgage. Roger Montgomery: And think about what happens when interest rates go up, or worse, interest rates don’t go up, they stay low for a long time because the economy is truly sick and people start losing their jobs and that is the really big concern that if the United States raises rates too early, we will get a repeat of 1937, we will get a double dip recession and the reason why that is a problem is because the previous recessions, and remember the United States are seven years into its growth cycle, and most growth cycles last about seven years. It is now seven years. If they raise rates and the economy slides into a recession again, well in previous recessions the Federal Reserve has cut rates by 3% to 4%, 300 to 400 basis points, when rates are zero there is not that room, so what happens after that and that is a big problem because the reason why I relate that back to Australia is because Australia growth is tied to China’s growth, China’s growth is tied to the United States’ growth and Europe. Europe isn’t going well, Japan isn’t going well, the United States might go into recession if they raise rates too soon so that can be a big problem for property investors. In any event there is no doubt that the basic rule of investing is true, the higher the price you pay, the lower your return. Mark Draper: That is certainly good advice Roger and in terms of thinking about property, what would your advice be for bank shareholders that are arguably leverage to the Australian property price. Roger Montgomery: So it is important to understand that the highest risk mortgages where the LVR (Loan to Valuation Ratio) is higher than 80% or 85%, there is usually mortgage insurance taken out so that derisks the highest risk mortgages for the bank and that places it on the likes of Genworth and GIO or QBE rather and so they’re the ones that you need to be worried about from a business perspective rather than the banks. Having said that though sentiment will turn against the banks and the share prices might suffer but that could be an opportunity to buy them cheap again so the business performance might not suffer as much as the share price performance. Mark Draper: Right. Thank you very much for your time. It is a hot topic. It is a hot market over here in New South Wales. We appreciate it. Roger Montgomery: It’s a pleasure. Thanks mate. In the long running obession that Australians have for the property market, we have sourced the latest affordability charts that outline housing affordability in Australia (a key measure of price), relative to other countries property markets. The key measure used is the price of property relative to income. The higher the multiple of income, the higher the price. The first chart shows that Australia's property market is far more attractive than Hong Kong and even New Zealand. Measured against Canada, a country that has many similarities to Australia, our market looks stretched. To put this chart though into more perspective, let's consider what sort of levels are considered unaffordable. Here is a table showing broadly accepted definitions. Finally the table below shows the numbers on a "State by State" basis. "Hong Kong's Median Multiple of 17.0 was the highest recorded (least affordable) in the 11 years of the Demographia International Housing Affordability Survey. Again, Vancouver was second only to Hong Kong, with a Median Multiple of 10.6. Housing affordability in Sydney deteriorated to a Median Multiple of 9.8, which was followed by San Francisco and San Jose (each 9.2). Melbourne had a Median Multiple of 8.7 and London (Greater London Authority) 8.5. Three other markets had Median Multiples of 8.0 or above, including San Diego (8.3), Auckland (8.2) and Los Angeles (8.0)." Jeremy Grantham, a world recognised investor with GMO remains concerned at the levels of the Australian property market and we would encourgage investors to exercise caution in assuming the run up in property prices will be a permanent feature of the Australian economy. Note: Charts sourced from Mike Shedlock "Mish's Financial Trend Analysis"
Australian House Prices - Bubble Trouble? We do not wish to join the queue of forecasters calling an Australian house price bubble, but we did think it worthwhile to flag this graph that appeared in a recent Financial Review article. The chart below tracks median house prices in several western countries since 1995. Clearly the red line, which is Australia shows the highest rate of growth in house prices since 1995 from the countries selected, with Canada coming in second. Canada of course joins Australia as an exporter of raw materials to China, and in many ways is considered a very similar economy to ours. The next chart shows the house price growth per state in Australia from the Reserve Bank. This graph shows sharp price increases particularly in the eastern states (left side of graph), with more subdued price action in Adelaide and Canberra. Finally we consider the state of Household Finances, particularly the level of debt in the household sector. The graph below clearly shows that following the GFC, households have not really reduced their debt levels, from an elevated level - they have simply slowed down their rate of borrowing. Australian house prices are considered to be the second most expensive in the world. While we are not calling for a property crash, which would be in no-ones interest, we are suggesting caution for property buyers given that Australian houses are significantly more expensive than their US counterparts, and Australians have taken on more debt than many of our overseas peers. Debating the state of the Australian Residential Property market is a national past-time, so with that in mind we will contribute to the debate. This article shows the Australian Residential Property market in a series of charts that compares our market to either historical averages, or other property markets around the world. The chart above shows the price of property compared to average income for the last 100 years. Clearly, current pricing is at an all time high relative to incomes. This chart shows the house prices compared to rent received, measured as a deviation from the long term average. The third graph shows House Price to Incomes, and measured on the basis of deviation from the long term average. Finally, the chart below shows in blue the value of the median house price in Australia. The Black line shows the median house price in 1986 if it were simply indexed to wages growth. This chart confirms the disconnect between house prices inflation and wages growth. Clearly houses have risen far more significantly than wages since 1986. We recently asked well known Australian investor Roger Montgomery for his thoughts on the Australian property market - here is a short video with his thoughts. I recently had a client ask me to assess the merits of an unlisted property trust offer that he had received - the name of the offer shall remain nameless, but I thought it would be interesting to walk you through the key reasons I advised to disregard the offer. I must highlight that on the surface of it, the offer looked very attractive with a juicy rate of income of 9% pa and some lovely photos of the building with a well known listed company as the major tenant. Firstly, the trust consisted of only one office building, so there was no geographic diversity. Add to this that 80% of the building was leased to one company and this means that investors are not only putting their eggs into one basket (one property), but almost totally relying on one tenant. The tenant was a successful listed company, so we are not arguing that the company would go broke, but highlighted what would happen if that company wished to relocate into larger or smaller premises. If this happened then virtually all of the income is vulnerable. There were two other aspects that concerned us. One was the average lease expiry which was only until 2016 - which means that the income from the property was only really secure until 2016. Finally this property trust was an unlisted property trust which meant that in the event of an investor wanting to get their money back, for any reason, there is no mechanism to do this. I thought this was an interesting exercise in the aspects we consider when deciding to proceed or "bin" an investment idea.